Light Glimpses of Life | Did You Photoshop it? I was showing some pictures to a friend who is a photographer and, while browsing through them, he was using monosyllables like “Yes!”, “Hmm!”, “Nice!”. Some could get a condescending “Interesting!” and some he did not emit a sound. At one point, he said: “Nice picture! Did you Photoshop it? It is a perfect imitation of a primitive photograph!”. 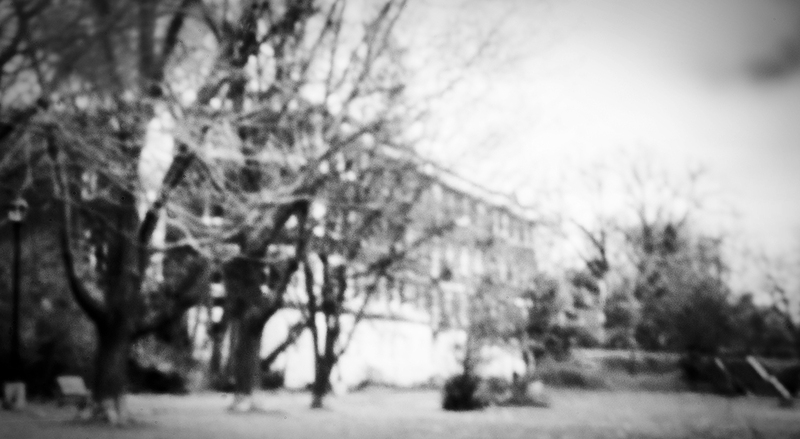 He was referring to the picture shown above, one more failure of my pinhole project that I mistakenly placed among the others (a real pinhole photograph using a modern DSLR camera with flaws that resembles the primitive pictures taken by early photographers. Little processing was applied, basically contrast enhancing and black and white transformation). Wow! The only picture that I actually did not photoshop or process, was that one! Everything else had various degrees of processing depending on the effect that I wanted to achieve. Obviously, being in the field, he should have noticed this fact but was not sure whether the pinhole one was my invention or not. I explained my project, basically removing the lens of my DSLR and replacing it with a tiny hole made on aluminum foil glued to the original camera’s cap. I made him aware that the pin hole would never cheaply replace real lenses because the small amount of light that comes in to the sensor of the camera would always require a tripod and an exposure time ranging from 5 to 15 minutes, turning the pinhole project not practically viable for normal use. After listening to my explanation, he started ranting that he hated “Photoshopping” even though he was working in an area that required lots of it. He went on by saying that he envied the old times when a photographer would choose a camera, a film, took a picture, took the film to the laboratory to have it printed and the whole cycle would end there. No processing. No gimmicks. Photography in its pure sense! I did not want to open a discussion on the issue but, as you are going to see in the next paragraphs, things were not in the “old times” and are not in the “modern times” exactly the way he was saying because there are some things called filters to produce certain effects. Light cannot be perceived and sensed unless it leaves an impression in our retinas. To get there, the proper amount of light is controlled (filtered) by the eyelids, is again filtered by the iris, travels an exact distance through the eyeball (which contains a liquid that filters the light) until it reaches the complex system formed by the retina which translates (filters) light into signals that go to the brain and is finally interpreted (filtered) according to some experiences and standards (filters) particular to each individual. Photography works approximately the same way (a caveat here: Photography and vision have similarities and distinctions that are beyond the scope of this article). The light reaches the lens (a filter), gets its amount controlled by the aperture and shutter (filters) to reach the electronics of a sensor or the substances of a film (both complex filters). After temporarily being stored in sensors or films, now the light impressions are taking some shape. Films go to laboratories to suffer the application of chemicals to remove (to filter) some parts of the film and leave the desired impressions, using processes (filters) called “C-41”, “Cross-Processing” or others. Electronic signals arriving from the sensor are converted (filtered) to digital signals, then adapted by tonality curves (filters) to produce that specific image characteristic of the camera brand we are using, that goes to several filters to produce a JPG or RAW, which is finally stored in memory cards in a specific format dictated by the vendor (another filter). The last step is print the film in paper that could have the “Glossy Filter” or the “Matte Filter”. And I am not talking about famous photographers of all time that apply and applied intermediate filters like “Dodge” and “Burn” (and many others) to enhance the results or effects. On the digital side, images are read from the cards and converted (filtered) to digital information in computers, suffered the application of various filters provided by programs like “Photoshop”, “Gimp” and others to twist and bend the images to produce effects as desired, or perhaps printed using special filters provided by printer’s makers. Filters can be of various types, for example, optical, mechanical, electronic and chemical and always produce an effect. If we want to see a picture with a strong red tonality, we can force the light to go through a red colored filter that removes other colors present in the light thus leaving only its red component. If we want to produce a picture that mimics our eyes’ field of view, we could use a filter called “50 mm lens” because this filter forces only the light arriving from certain angle of view to unscathed excite our senses. Photographers used Velvia and Ektachrome films to obtain (effect) certain characteristics of tonalities and types of pictures, each one a filter in itself (even today, Ilford films are used for their rich and deep black and white impressions), not to mention the “Lomo Filters” with their absurd and creative effects. Certain camera brands are known for their ability to deal with (to filter) the noise inherent to all sensors and produce (effect) almost noise free images. If you think that this idea is a stretch, take a look at the construction of a digital sensor or the production of a film and you are going to see how many filters are there. Do you think that lenses are not filters? Have you seen a schematic drawing of the simplest one to check how many different filters and coatings for many purposes are there as well? Wrapping up, it is my understanding that there is not such a thing as Pure Photography or purists in Photography by the multitude of filters that are applied in each step of the process. Granted, a photographer may say that a Kodakchrome film is always the same; however, did the photographer chose ASA 100 or ASA 400? It is known that the more sensitive the film (the filter), the grainier are the pictures (the effect). At the digital land, there is a long debate about JPG and RAW pictures. Purists advocate that JPG is the real one because what you see is what you get. Just a second! To produce a JPG image, the photographer has to choose the white balance, the ISO, the shutter speed… They are all filters that produce specific effects. I understand that Photography with film provides a smaller palette of filters as compared to digital. True, film photographers need to be a lot more skilled because films are expensive, slower to process and there is no preview to correct the settings. Memory cards can hold hundreds of pictures; the good pictures are used and the bad ones are erased to make space for new pictures. Films, on the other hand, hold at most 36 pictures and, once taken, good or bad, the corresponding “space” is gone forever. To be a good photographer with film requires a lot of art, sensibility and experience. Not that there are not good photographers in the digital era; on the contrary, art and sensibility still need to be there but experience comes more with the errors than anything else. 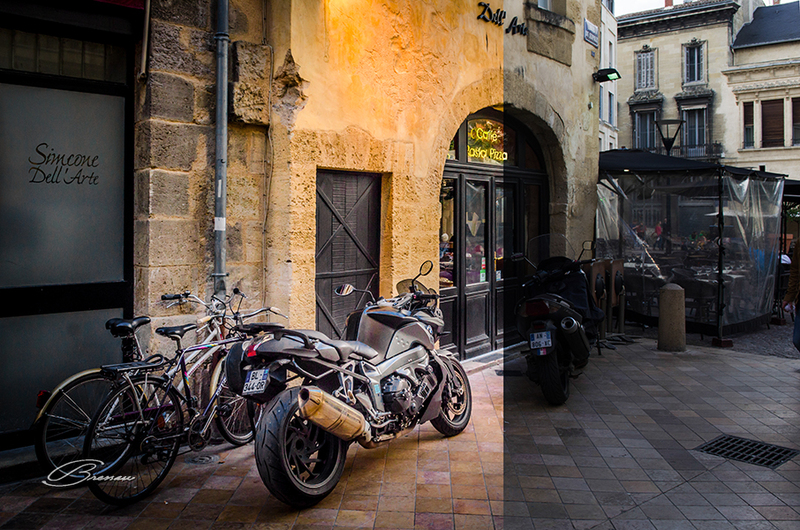 The rather dull original RAW picture at right was processed to produce the image at left. Only basic filters were applied like straighten the lines, contrast, a bit of sharpening, white balance, color and light adjustments. In comparison, it takes a great deal of tweaks in the camera and experience to get a JPG image that probably would not be the same as the work done here. From this point on, let me focus the discussion on digital photography with its characteristic processes that keep an intimate distance with traditional photography. In this way, it is possible to categorize filters in two groups: the ones applied in the camera until a picture is recorded to a memory card and those applied afterwards. However, there is a grey area between both groups as someones can be either applied on the camera or in the computer, for instance, the white balance, exposure correction and even to obtain the HDR effect, etc. Let us see the differences. The Purism Factor: How perfect we want an image to be? Some cameras are able to produce HDR and panorama pictures with a quite good degree of quality but nothing compares with the ones processed by a computer. Cameras also do the white balance and sharpening but “that” precise and perfect final touch can only be achieved when we have full control of the settings in a computer. Again, if we are satisfied with what a camera produces, we are good to go with the pictures gotten straight from the memory card; otherwise, they have to go through a processing step in a computer and the RAW image format seems to be the best conveyor of the information from the camera to the computer. The act of processing an image (or for the subject matter, “photoshop” it even though the software would Aperture, Picasa, GIMP, etc) is the procedure of submitting the image to a series of filters to produce some desired effects. Literally, the pixels of an image are twisted and bent using specific methods (filters) until these pixels are considered “polished” enough according to our senses. The range of the possible work to be done is broad but it could be structured in three basic classes discussed below. Obviously, this discussion only applies to photographers willing to apply further processing to his/her pictures. Rarely a picture that comes out from a camera does not need a slight tweaking here and there like straightening the horizon line, a minor correction in the white balance, adjustments in the colors, cleaning small specks either from the sensor or from the scene, sharpening, lightly cropped and so on. If the picture is in the RAW format, this step is crucial because it needs to be converted to JPG before being displayed. In essence, this stage just makes the pictures more presentable, resembling as much as possible the real scene. The popular advice to photographers stating to just take pictures and not disturb the scene, possibly leaving it cleaner, also applies in reverse here: “Leave the pictures out the camera as undisturbed as the real scene was, possibly a bit cleaner”. If we want to go a step furthermore, the images can be transformed into black and white, cross-processed, cropped, converted to HDR, and/or suffer a myriad of other processes and filters that still render the images recognizable in relationship to the real scene. This word possesses a somewhat negative connotation but reflects what can be done to pictures: manually change, convert, twist, modify, extract, add and replace elements in the picture or the picture as a whole. The resulting pictures may or may not resemble the real scene anymore. The use of artistic filters is a good example of manipulation that renders images visually artistic. Another notorious cases are the transformation of otherwise physically regular people into Muses and Adonises with soft skins without a single body deformity and the removal or addition of objects or people to alter History or to make a product more acceptable. Not all manipulations are bad but I think that the limit is when the images become deceiving or when they are intended to deceive in a malicious or advantageous way. A digital art rendering. 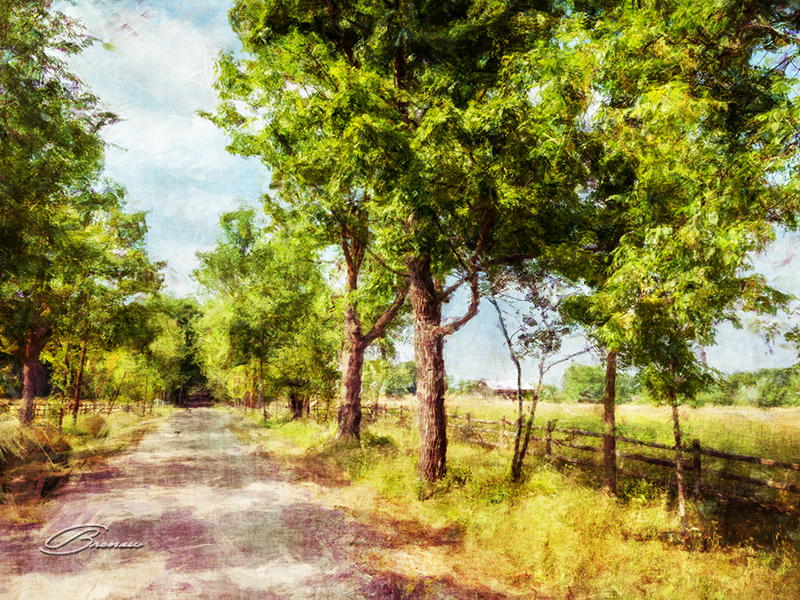 Multiple filters were applied including several passes of watercolor brushes. Some features present in the real photograph were changed or removed to mimic a real paint procedure. If we want or not, Photography is filled with filters to produce effects at every step taken. Perhaps, we tend to compare effects with the early days of Photography where everything was black and white and pictures were kind of “well behaved” because technological resources were scarce and the existing ones tried to mimic reality. Anything that did not approximately follow this conservative behavior automatically became “different” and subject to various degrees of approval or disapproval. Therefore, some effects are considered “natural” and accepted with no restrictions. Others, not so much. What is the difference between Digital Art, with all its variations, and a glamorous digital manipulation of the rather ordinary? What makes a picture to be a “good one” whether taken with a conventional 50 mm lens or the somewhat bizarre Lomo camera? The truth is that masters of Photography not only were and are very careful, imaginative and skilled when pressing the shutter, but also spent and spend hours in their laboratories dealing with chemicals, optics and software to produce pieces that forever delights our eyes. In my opinion, it all depends on the standards that I set (based on past experiences) to accept this or that picture, and it all depends on the purpose of the picture. I respect the work of all kinds of photographers although I have my preferences and my line of work. But, I do not accept the pictures with the intent of deceiving (implied or explicit) and to gain advantage, specially the ones that cannot immediately be verified. A final word on this subject: if you are wondering that unfair manipulation is only the “after the fact”, think about photographs taken with staged History. They can be perfect original pictures in all senses but our lives will not be the same anymore, for good or for bad. Other than that, let us always welcome creativity!